One of the main things I’ll research before visiting a new place, whether it’s in the UK or abroad, is where to eat. 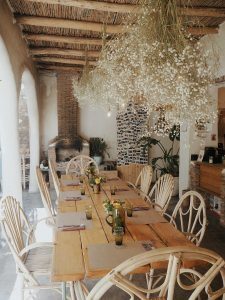 Good food and trying new cuisines is such a big factor in the enjoyment of a holiday, for me anyway, so I like to always be prepared with a list of trustworthy places to go to if I can’t find anything else on my strolls. 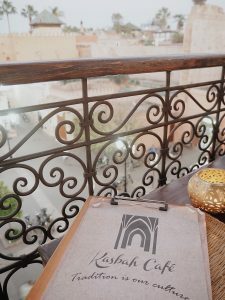 I’m here to do my bit for anyone out there like me, here’s five tried and trusted places to eat in Marrakech. One of the first and most frequently mentioned spots I heard about was Nomad. 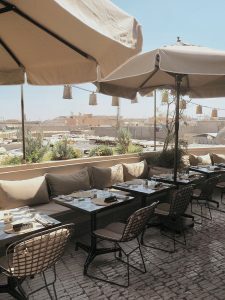 It’s based right in the centre of the Medina near the souks and has incredible views down onto the markets. We booked about two weeks before our trip and I’m so glad we did. I booked for 1pm but we stumbled upon it around 12pm so went inside anyway. By 12:30 every table was taken up and someone was keen to take ours in the shade. 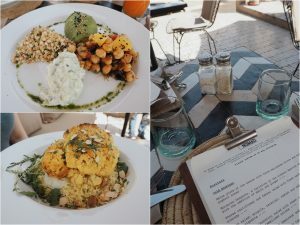 The menu is full of very healthy dishes, food you would find in the UK but with a moroccan twist. I opted for the vegetarian plate and Mum had the roasted cauliflower. Mine was delicious I must say! Mum enjoyed hers but she did think it was missing something, it was a bed of couscous with a cauliflower on top – what it said on the tin granted but maybe some sort of dip would have helped. The seating is very comfortable and the decor is lovely. Pricing is average for your cooler joints around, we paid 350 Dirhams (£27.91) for two meals, a coffee, water, two juices and service charge. 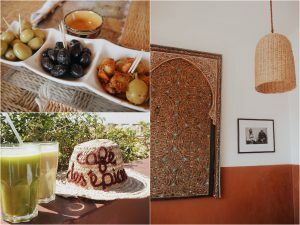 I found out about La Famille on a Telegraph article rating it the best spot to eat in Marrakech. I hadn’t heard anything else and I hadn’t stumbled upon their social accounts either. We spent forever looking for this place, I had the spot on the map but we must have walked past it about 5 times. It was all our fault, it’s within the winding streets, a little doorway with a plaque on the side. We had been searching prior to opening and if you try that, you just won’t find it! We walked in about 12:05pm and opening was at 12pm; within 10 minutes it was full. The place is stunning, decor is so up my street, the outside sink is gorgeous and the menu is all vegetarian. We shared two salad dishes and had two of the beetroot juices. It was very tasty but the flavours are unusual. One of the salads came with a pizza which was topped with yoghurt and orange – nice but not for everyone. The menu is small, it was a choice of only four dishes. I would highly recommend coming in even if just for a drink or a dessert and they have a lovely little gift shop too. After trying all the cool spots to eat, it was time we tried a couple more traditional spots. 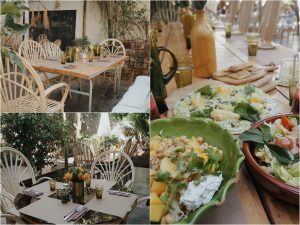 I had spotted Cafe Des Epices a few days before as it’s a building right next to an outdoor market we were exploring, it was easy to find again and we headed on up for some lunch. As everywhere, it was busy again and we had a spot in the sun but I pulled an umbrella over and it was fine. We had some juices and a big bottle of water to cool down before tucking in to a traditional tagine. 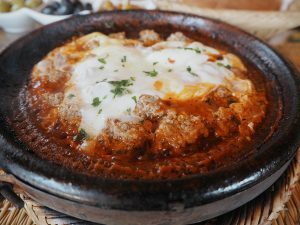 I went for the Kefta tagine which is minced meatballs and a fried egg in tomato sauce. It was really good – very hot but very good! 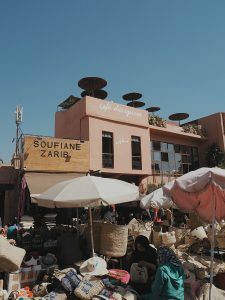 Make sure you have some water as just being near the bubbling tagine was making me sweat in the heat! The prices in here was much more reasonable, about half the price we were paying elsewhere. 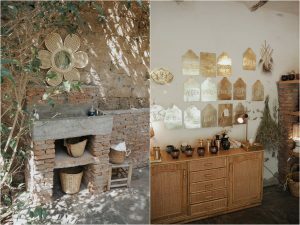 This little place was right outside our Riad and I’d been eyeing it up every time we wandered past. We finally headed in on our last evening, we tended to head back to our Riad before it went dark but as this place was so close, we went out and had dinner around 8pm. There’s three floors of seating and we opted for the roof terrace so we could see the sun come down and watch the world go by. We started with two lovely juices and then ordered our food. I had the chicken skewers and Mum had vegetable cous cous. 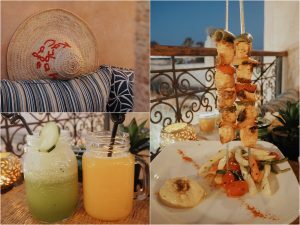 I must say, these chicken skewers were possibly my favourite meal in Marrakech – they were so tasty and came with roasted veggies and humus, yum! The menu here was one of the biggest we’d seen, there’s pretty much something for everyone as they even have pizzas, burgers and salads. The pricing was around 100 dirham per meal (7.89) which was reasonable. 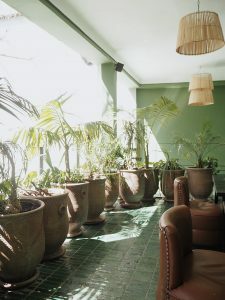 And finally, everyones favourite, Le Jardin! Hidden near the Secret Garden is this absolute beauty of a lunch spot. This place really is a garden of it’s own, decorated in large plants throughout, birds chirping and even a little tortoise which I couldn’t spot but he was in there somewhere! 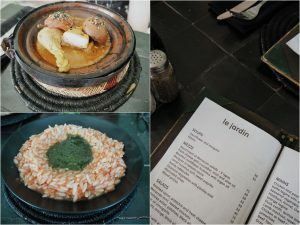 Le Jardin again as expected, is pretty busy at all times so I would recommend booking which is super easy to do online. The menu here was a good size, there were several options we were toying with. Mum went for a chicken and pear tagine which she really enjoyed and I opted for the pesto orzo pasta. It doesn’t look like much but it was so tasty! 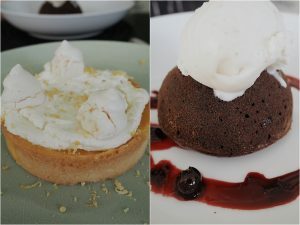 We were headed out for another busy afternoon so we treated ourselves to desert also – not traditional or moroccan at all but SO GOOD! I hope this is helpful to anyone planning a trip or it’s just made you hungry like it has me! Let me know if you go to any I’ve mentioned or if you have any others to recommend! "The Fear Of Outgrowing Your Baby Years"